One morning last week, I stopped to have a word with this lady who was cutting the dead flowers from her magnificent display of geraniums. She told me that she only gave them water twice a week and, of course, they enjoyed the sunshine – (don’t we all?). At the end of the season, she cuts the plants right back and takes them inside to store them. After re-potting in January, she gradually reintroduces the plants outside (poco a poco) – little by little to warm in the sunshine – and the following summer, they bloom again. These geranium plants on her terrace are three years old. So – now you know! This entry was tagged Andalucía, East of Malaga, flowers, garden, gardening, gardens, life, Malaga, photography, Spain. Bookmark the permalink. For the life of me i cannot grow geraniums here. Every year they die. I’m quite green fingered so cannot work out the reason. They die a slow lingering death. Maybe they need mouth to mouth resuscitation. Lol. The colors are gorgeous. Pinned! A dedicated lover of gardening is your lady and it shows in the love and care she lavishes on those beautiful geraniums and they repay her and us with such a lovely show. How stunning! She’s obviously very green fingered and knows her stuff! 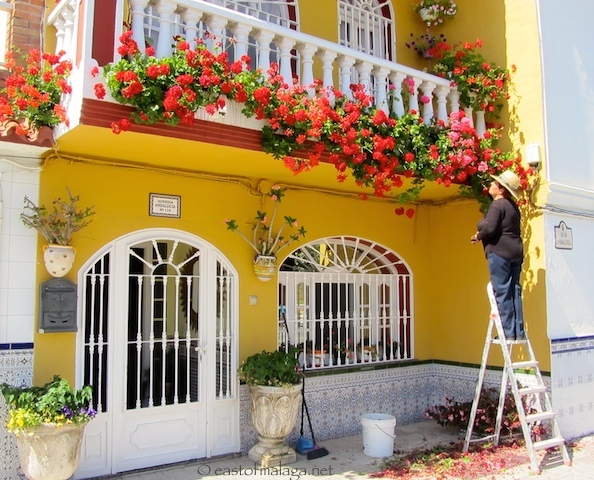 What beautiful colors, the house and the geraniums. Gorgeous! It puts my pots to shame. Yes, they do, generally – and we have some in our garden similar to yours, that come back year after year. We have more trouble with our pots though, which I’m pretty sure is to do with over-watering. She knows her stuff, the make such a beautiful display! Oh so much work! I’d never have the patience (or the time!) to do all this! But if you enjoy doing this and you have the time, you are always so richly rewarded, those flowers are SO beeyutifulll! WOW! I have some really pathetic looking geraniums planted in my front yard. Guess I just don’t have a green thumb! Thanks for sharing this gorgeous picture! Maybe I´ve been watering mine too much. The flowers have died and they are not blooming anymore. These geraniums look fabulous! I understand your difficulties, Darlene – we have trouble with them too – so fingers crossed for this time! !